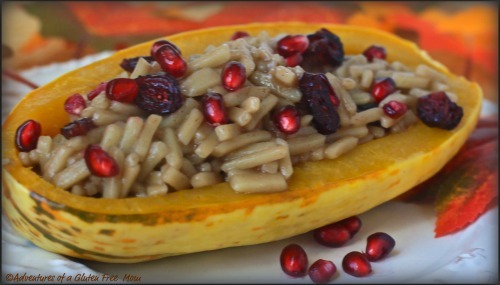 I will be sharing the recipe for the Orzo Stuffed Delicata Squash in a guest post I that will be doing on Thursday, November 11th over at The Gluten Free Homemaker, for Linda’s awesome Squash Fest series. In order to make it though, you will first need to know how to make homemade gluten-free orzo pasta (at least in theory anyway). I used to love orzo pasta in my former gluten-eating life and it is one of the few things I still miss from time to time. Orzo is the perfect accompaniment to sauteed spinach with olive oil and garlic and there is a recipe I have been itching to make for Sauteed Shrimp with Orzo, Spinach, Feta and Dill, yum! Several years ago I found a company that sold GF orzo pasta made from lentils, but I was still stuck in my black hole of wanting GF foods to taste identical to their “gluteny” counterparts, so I did not care for it . I think I would like it much better today, but when I went to try and order some, I found out the company is no longer in business. I queried the almighty Google on an orzo pasta maker thinking I could just make it myself using gluten-free pasta dough, but no such luck. I did however, come across a video on YouTube of a blogger named Cat from Having Fun in the Kitchen, demonstrating how she makes homemade orzo pasta (of the gluten variety). Brilliant, I can do that! As you can see in the video, it just shows Cat cutting the orzo with a knife, but it isn’t clear what size/shape of pasta dough she is cutting it from. A logical person would have gone to her website for further research before attempting this on their own. I, on the other hand, am anything but logical. Or, if making homemade orzo doesn’t sound like your idea of a good time, you might also try using a tiny shaped gluten-free dry pasta such as Le Veneziane’s Ditalini . Lastly, if you weren’t aware of the Squash Fest going on over at The Gluten-Free Homemaker, just click on the image below to start at the beginning, there are some yummy looking recipes being shared that would be perfect for Thanksgiving! Sounds delicious; great recipe…I love your blog! Fabulous recipes and content. Keep up the great gluten free work! I have a recipe for one our favorite salads (curry chicken with orzo pasta) and I would love to be able to make this for the kids too. It is sooooo yummy! You are so inspiring! I wish I had the motivation to make gluten free pasta from scratch at all…let alone hand cut orzo! Sounds delish no matter if it was misshapen! This is THE most beautiful photo! You are such a tease … making us wait two more days to find out the details on how you made this pasta. 😉 Can't wait though–yummmm. Too funny! SInce I already crossed over to the glutadoodle side long ago, I would probably done the same as you! 😉 However, I must say AGAIN that you and Kurt are so so alike. I can only imagine if the two of you come up with some business idea together. LOL He jumps right into everything he does, while I am running after him saying "Wait! You forgot this step!" I have this amazing Shrimp and orzo salad recipe that i have not made in years. I am thinking this would be a perfect perfect time to re-visit it with these little homemade gf orzo! I think the only way I have had orzo is in Rice-a-Roni LOL. Isn't that a blend of rice and orzo pasta and spices? I bought the lentil orzo from a company called Papadini, does that ring a bell? Yes, that was it! I loved that stuff! Then the local health food stores quit carrying it. Honestly, I'm just seriously impressed that you made your own GF pasta – and it looks so great! I think I would be a fumbling mess all the way. Ya know, I thought I would be a fumbling mess too but after I made Shauna and Danny's pasta recipe (from their new cookbook) for the first time, I was surprised at how simple it is! I will probably reserve making pasta for less time consuming preparations though, the orzo is a little tedious, LOL! Hey – happy to know you actually like my orzo. I was mostly just playing one day with my camera and ended up filming that short demo of how easy it can be to make orzo shaped pasta at home. Hope you can find more interesting recipes on my blog.